Discussion in 'Downhill & Freeride' started by Kntr, Apr 19, 2013. No can do. My 60 pound Brooklyn will not work with that rack. That's a nice rack... at first I thought it was for the home. Well, I don't think aerodynamics are the main goal of the Jackknife.... its a good design.. no frame contact and it will hold 4 DH bikes... I know the engineer who designed the rack and it is based on the short lived Arbutus rack design. I have one on order and they should be available in early May according to Swagman. I want an Arbutus rack! I was wondering if this was the newest incarnation of the arbutus and must say I am let down.. Honestly the original configuration worked better. Arbutus NS and ratte racks have all proved that.. I'm sorry but 4 bikes sideways is going to have way more drag than 4 bikes straight on. Not only that but if you haven't got a wide vehicle the seats will stick out way past the sides of your vehicle then you have to explain why someone's mirror is hanging off your saddle instead of their car. Its narrower than tray rack system, especially if you are carrying a DH bike with a long WB on a tray mount. Non-issue unless you drive a compact. Works fine on my smartphone and desktop. Its $630 w/free shipping at that site for the 4-bike. 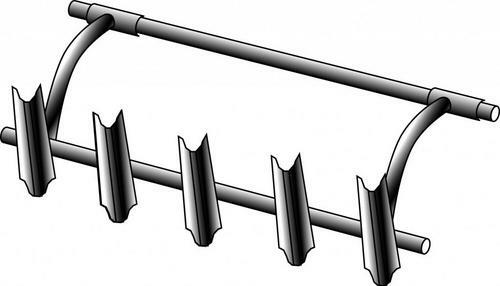 Anyone get this rack yet? How can that thing hold a kids bike? Gotta play devil's advocate here: Why not make a 4-5 bike one using a simple, everybody-sells-one hitch cargo basket as the base? I like my 3-bike Hollywood tray-type just fine for most uses but want something more 'shuttle-worthy' and am working up my plans right now to do just that. The website says it fits 26/29/700c wheeled bikes. What about 27.5 / 650b? Gotta play devil's advocate here: Why not make a 4-5 bike one using a simple, everybody-sells-one hitch vargo basket as the base? I like my 3-bike Hollywood tray-type just fine for most uses but want something more 'shuttle-worthy' and am working up my plans right now to do just that. I dig it. Only issue I see w/it is getting into the back of the vehicle on long trips. I like the basket idea. You could even make the front wheel holders flip up so you could get the hatch open. That seems like a pretty neat idea, albeit only applicable to a specific vehicle. I like the basket idea. You could even make the front wheel holders flip up so you could get the hatch open. That seems like a pretty neat idea, albeit only applicable to a specific vehicle. Thanks. It's an idea that's been brewing in my amateur-fabricator's head for a year or two now. I really think the idea is applicable to any 'wagon-like' vehicle - - wagon, SUV, Suburban, etc. - - and, of course, any of those with a roof rack or crossbars you could tie into. 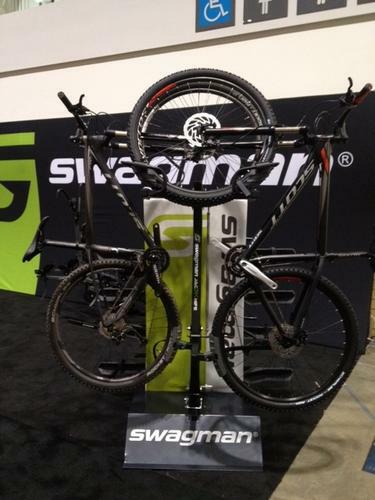 Would it not be a little easier to hang a bike on the Swagman rack by the rear wheel? Or would we have to have a list of all brands of brake that would be ruined by doing so?